I am terrified of the post office. There I said it. Ridiculous, I know, but its true. Its not that it’s difficult to get to, there is one two blocks from the apartment. I pass by it most days on my way to the beach or the grocery store or wherever. But I’m afraid to go in. 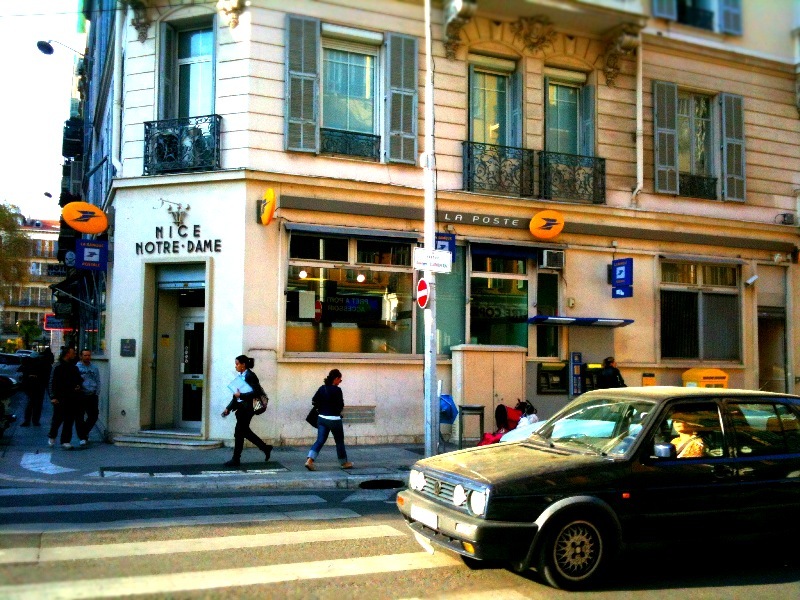 In my mind, the post office – or La Poste as it is adorably called here – is the pinnacle of impenetrable French bureaucracy that sends a fiery bolt of fear down my spine. There are so many rules and procedures to follow beyond those doors, so many kinds of boxes and envelopes to choose from and so many signs written in a language, in which I can only understand about a fifth of the words. It’s also crowded, with every specimen of French society waiting impatiently in line. There are kids crying and running around, dogs yipping and pooping everywhere, and post office workers at their wits end by the time I get up to the counter, with far too little patience to guide a clueless American such as myself through the process of sending a package and buying post card stamps, while the line snakes out the door behind me. 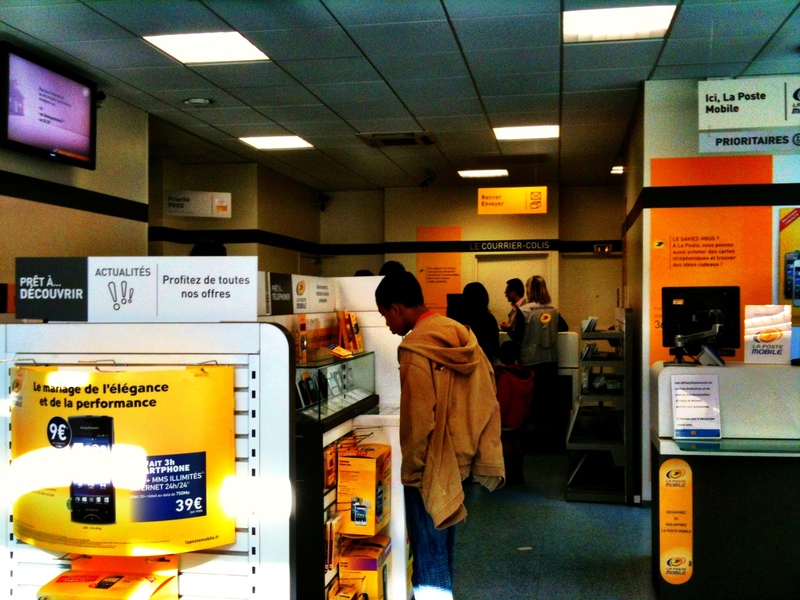 It is precisely this (ever-so-slightly inflated and irrational) fear that has kept me out of La Poste. Until today. I love mail. LOVE IT. I love writing letters and post cards and curating packages. I love sending mail, and imaging happy recipients on the other end clutching lovingly prepared items in their hands. And of course I love receiving mail. After all, what is better and can make you feel more instantly loved, than opening your mailbox to see an envelope with your name and address scrawled in familiar handwriting? I know I am in the minority in this increasingly digital world. Of course an email or a text message or a Facebook status update is a million times more efficient, but those things lack the romance of physical mail. They don’t stand a chance next to the look and feel of an honest to god letter or parcel delivered to your door. My affection for the art of letter writing propelled me down the stairs and out of the building towards La Poste. Prepared with tape and a pen and my little stack of items to send to my mom and a birthday gift for my sister, I was ready to face my fear head on. As I approached the post office, I took a breath, pulled open the glass door and stepped inside. To my surprise, there were only a handful of people quietly going about their business inside. No dogs, and no line to speak of. I started off with my customary routine: standing awkwardly and idiotically blocking things that people were trying to reach and generally being in the way for a few minutes. And then I found the envelopes: “France, Europe, Le Monde”. At least my options were clear. I navigated away from the large, bulky €80 box to the more appropriately priced and sized €12 mailing envelope and placed my items inside. Before I could get into formation behind the one woman ahead of me, a friendly and efficient looking woman of about 40 with frosty blond shoulder length hair and thick black liner circling her eyes, came out from behind the counter and asked if I needed help. “Je voudrais envoyer ca aux Etas-Unis” (I would like to send this to the United States) I forced the words out of my throat and looked at her hoping not to have to repeat myself. “Ok” She said and instructed me how and where to address the padded sleeve. Then a jovial young man wearing a slightly wrinkled pink and blue striped shirt, about my age waved me over to another counter. I repeated my reason for being in the post office, and apologetically explained that I wasn’t sure of the post-code for my return address. He feigned surprise and then scribbled the numbers on the back of the envelope for me and told me I spoke French well. My cheeks instantly filled with blood as I demurred but the tension in my clenched shoulders subsided. He was being polite (I can assure you I do not speak French well) but his friendly flirtation put me at ease. We shared a minute or two of polite conversation as he processed the package and rung up my post card stamps. He admitted that French is a difficult language to learn, and then very slowly and mockingly counted back my change to me one coin at a time. I welcomed his good-natured teasing and we exchanged smiles and pleasantries as I turned to leave. I nearly skipped out the door feeling equal parts relieved and triumphant. Yes, I realize it is infantile for an adult woman to feel such satisfaction from completing such a facile and perfunctory task, but that simple exchange felt like an achievement. Emboldened by my success, I marched confidently to my second least favorite place in Nice: the cell phone shop. Trips here usually entail some combination of being helped by someone with utterly transparent distain for me and my weak grasp of the language, or worse: a smarmy sales man simultaneously ogling me while telling me that whatever it is I’m asking for is pas possible (not possible). My experiences at this establishment up to this point have been so embarrassing and maddening, I have contemplated instating a purely digital communication rule. But with the winds of my recent postal triumph in my sails I soldiered on. This time, I breezed in, asked for a €15 credit for the Englishman’s ancient French mobile phone that I use here (think of the first cell phone you’ve ever had. Not Zack Morris old, but not far off). And with the slip of paper in my hand and a curt “merci” was on my way. Feeling pleased with myself, I called the Englishman to tell him all of the exciting progress I had made. He sounded far away on the other end of the line and told me he was driving near the Israeli – Lebanese border and couldn’t really talk unless it was urgent. Uh, no… my big news of going to the post office, didn’t quite seem like an urgent matter. But I decided to walk down to the sea front for a celebratory read of my book on the beach just the same. With the hot sun and gentle breeze on my face, I reflected on the day. Absurd really. But I needed to break the seal of sounding stupid – I may as well just get used to it. And hey, within a week of being back, I can already send mail and make a phone call. Only time will tell what I might be able to do next. Like a trip down memory lane, like learning the basics all over again, small achievements can be celebrated even if it is only a trip to the post office! Definitely a fan of the old fashioned letter and still actively participating. Everything you wrote brings back all the same feelings to me from beginning to end. Sounds like you did extremely well though! I thought I was the only one who feared the post office. Everything you wrote brought back all those feelings from beginning to end. Sounds like you did (and do) extremely well though. « …And I’m back. In Nice.